Every parent I know wants his or her child to have the opportunity to pursue an education that will benefit the child's future. However, for many families paying for this education is a serious barrier. There is a simple way to get started! Since RESPs are often misunderstood and awareness of the Canada Learning Bond is very low, over 1.5 million kids are missing out on free education money through the Government of Canada’s Canada Learning Bond. Families are eligible for up to $2,000 from the Canada Learning Bond if their child was born in 2004 or later and their family income is under $45,000. I have mentioned previously about the benefits of SmartSAVER, a program of the registered charity the Omega Foundation focused on helping lower-income families make saving for their children’s post-secondary education a reality. Most families are not accessing this free money because they have never heard of the Canada Learning Bond, and they believe they cannot afford one, as they are unaware that they can open an RESP with $0. Without an RESP, children miss out on the Federal and Provincial education savings incentives they are entitled to. Since November is Financial Literacy Month and November 15 - 21 is Education Savings Week, SmartSAVER's has a contest that is open to everyone in Canada. 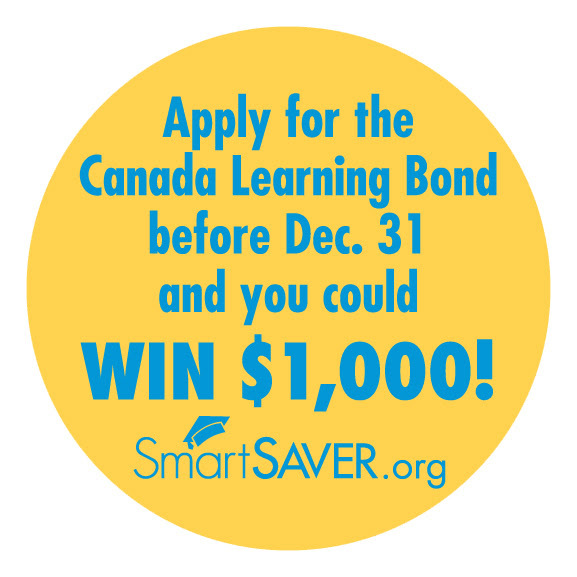 To participate in SmartSAVER’s contest, families will be required to use SmartSAVER's online application to open a no-cost RESP with one of six participating bank or credit union of their choice, and apply for their child's free Canada Learning Bond. Applicants will be automatically entered to win one of nine $1,000 weekly cash prizes between November 1st and December 31st. Visit SmartSAVER.org for full contest rules and regulations. What an awesome promotion! Thanks for sharing.